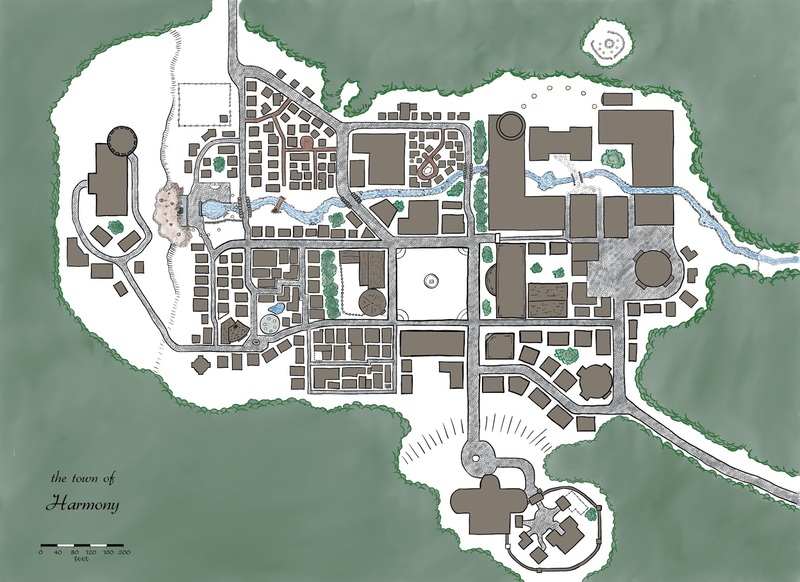 Lost Atlases: Harmony - a medium sized town where I once lived. This is Harmony - a town in the country of Veridia where I once lived. It is a peaceful town, well, as peaceful as a town that has a wizard academy on the eastern side and a clerical college on the west can be. Squashed in between are numerous dormitories, homes, shops, taverns and other assorted things necessary to keeping a college town running deep in the forest. Harmony is a town created for my GM in our current Pathfinder campaign. It's located in the Stolen Lands, where Kingmaker was and where we have set Strange Aeons. In our campaign universe it's a college town, with the magical academy in the upper right and the Clerical college on the hill to the west. It occupies the space where the "Temple of the Elk" existed in the first AP. Indeed, you can see the leftovers of the temple in the left center at the head of the stream.